Career management – even for the smallest non-profits – offers a strategic lever for stronger performance. Indeed, career management affects more than just employee satisfaction and loyalty. It drives better client service, faster identification of ways to deliver on your mission and increased opportunity for growth – for staff as well as for your organization. Lisa Taylor is founder and President of Challenge Factory and the Centre for Career Innovation. Her workforce and workplace perspectives have been featured in media outlets across North America including the Wall Street Journal, Huffington Post, CBC and The Globe and Mail. Taylor regularly speaks on the Future of Work, the intergenerational workforce and the changing nature of careers in today’s economy. Lisa Taylor hosted a FREE one-hour webinar on Monday, November 12, 2018 to further outline the resources and recommendations that non-profits and charities need to attract, engage and retain employees. With this Playbook, CERIC has created a resource that our managers and staff can use to help create more meaningful career development experiences. Lisa Taylor has shown us that the smaller average size of organizations in this sector doesn’t mean we can’t compete on this important component of employee value. The non-profit sector is a social and economic driver and our workforce is vital to deliver our impact. Now, more than ever, the non-profit sector needs to show its value to our employees and communities. We need to invest in our people. This Playbook provides the information and practical tools to attract, retain and engage our employees who are at the heart of our organizations. This is a must read for all leaders, employees and those considering a career in the non-profit sector because our people matter and our work matters. We know that career development is top of mind for many colleagues in our sector but the way forward isn’t always clear, especially in small organizations where resources and career paths seem limited. This Playbook offers simple, practical steps that can be customized to individual needs and aspirations. It’s an important resource to help us invest in ourselves and to grow the talent we need in order to best serve our communities. Retaining great people is a key issue we all face in the non-profit sector. 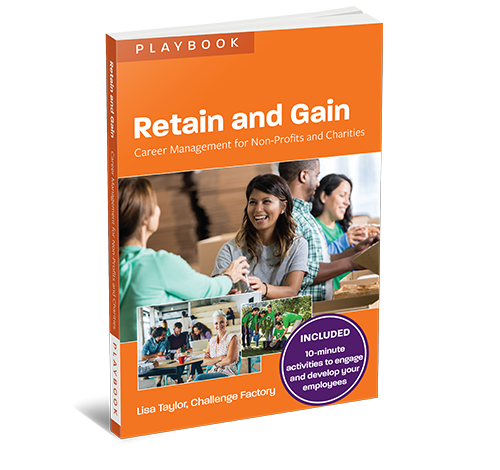 The Retain and Gain Career Management for Non-Profits and Charities Playbook is an impressive tool full of tips, strategies and resources that will be helpful to our sector as we strive to create decent work environments for all staff. Globally best-selling books on career development, management and human resources all fundamentally miss the mark for staff, managers and executives at charities and non-profits. This book so deeply recognizes the challenges, capacity and real-world issues facing the sector and responds by assembling a dynamic set of tools for the sector BY the sector to make real change happen. It’s going to be a ground-breaking resource for charities and non-profits across Canada! There is a leadership gap facing the non-profit sector. Retain and Gain is a timely and practical tool that can help sector leaders provide meaningful long-term career opportunities in the sector. Career management is not a topic that managers in the charitable and non-profit sector pay much attention to because they don’t have the time, the budget or they feel limited by the small size of their organizations. The Retain and Gain Playbook addresses those myths head on and provides a very useful roadmap for supporting employees in their career paths. It also contains all kinds of practical and easily accessible resources. This is definitely a go-to resource for new and seasoned people managers in our sector. Canadian charities and non-profits count on the passion, the dedication and the professionalism of their staff to get things done and deliver on their mission. But few feel that they have the necessary resources or time to invest in the career management of their staff. While resources and time are indeed at a premium, Retain and Gain is the ideal resource to help organizations support their staff and ensure that they can successfully manage their careers for years to come. Retain and Gain is fabulous. Not only does is offer solid, practical information, but it is designed in a way that respects the time challenges non-profit managers have to do good research on supporting staff effectively. Talking with staff about career management is central to the success of our important work and the future of the sector. I will definitely be using it as the ED of Vantage Point, as well as sharing it with the non-profit sector more broadly. Thanks to Lisa and CERIC for making it happen. Non-profits often overlook career development activities, assuming they are too expensive to undertake with their staff. In reality, there are many inexpensive and effective ways to support staff in improving their skills and advancing their career. Retain and Gain for Non-Profits is a fantastic tool for non-profit employers who want to attract and retain staff and emerging talent. I especially appreciated the concrete tips for managers and the abundance of additional resources. In this complex and competitive environment, attracting and retaining the right staff has become one of the most critical competencies required of leaders in non-profit organizations. This practical Playbook is a must-have resource for board members, Executive Directors and managers. It makes it easy to utilize career management as a strategy to engage and inspire staff, regardless of the size or resources available to the organization.